I did this walk on 3rd June 2007. I parked at Hemel Hempstead Station which was some distance away from where I finished my last stage of the walk along the Hertfordshire Way at Potten End. It was my intention to walk from Potten End to Kings Langley and then take the train part of the way back to Hemel Hempstead. I could have parked at Potten End and done the walk back from the station at the end of the day however as this involved a fair bit of road walking and heading uphill it seemed best to get this done early rather than as the last stage of the walk. It was free to park in Hemel Hempstead Station Car park on Sundays but £5 every other day of the week. From the Hemel Hempstead Station I headed down Fishery Road for a short distance to join the Grand Union Canal Towpath which I then followed off from the left for one and three quarter miles. One the way I passed a small swing bridge across the canal, the first one of these I have come across, photo 2. In complete contrast to last weeks torrential rain and cold the day was warm bright and sunny with only light breeze and hazy cloud up in the sky and it was very pleasant walking along the canal in the bright morning sunshine, photo 3. The Grand Union Canal is starting to make its way up through the Chiltern Hills and I passed quite a few locks, photo 4, on the stretch of towpath I walked as well as a sign indicating the distance to Braunston, photo 5, which was the original terminus of the Grand Junction Canal. Reaching Little Heath Lane I started heading back up the road towards Potten End. There was no clear alternative route to Potten End that I could see on the map so I followed the Hertfordshire way there. In the end it was a total of 3.79 miles back to where I had ended my last walk along the Hertfordshire Way by the outskirts of Potten End, photo 6. I then turned round and began retracing my steps back down to the Grand Union Canal. Crossing the road I headed down the remains of Grims Dyke.This runs through trees crossing a golf fairway in the process, as it makes its way to the village green at Potten End. The route makes it way down the side of the green, past the pond, photo 7, by the aptly named Martins Pond Pub, before turning right to take a path that turned right down beside a house to reach a narrow path that runs beside a bowls club. This then continues on into a tree lined track which reaches a driveway where the route turns right then left to join a road called Bald Beggars Lane that then passes through the national trust reserve of Little Heath. The road continues ahead over a cross roads, turning right at the T junction for a short distance before heading left along a wooded path. This leads to a stretch of grassy meadows, photo 8, where the Hertfordshire Way passes through a succession of metal gates to reach Little Heath lane. Turning left onto Little Heath Lane the Hertfordshire Way then makes it way downhill along the road down to the Grand Union Canal a distance of about three quarter miles. To the left there were fine views across the valley below towards the hills I would soon be ascending on the other side, photo 9. The lane was very quiet and both times I walked it I was only passed by two cars. Just after crossing some rail lines the Hertfordshire Way reaches the Grand Union Canal, photo 10. Here the route crosses over bridge 146 and heads off to the left along the canal towpath. 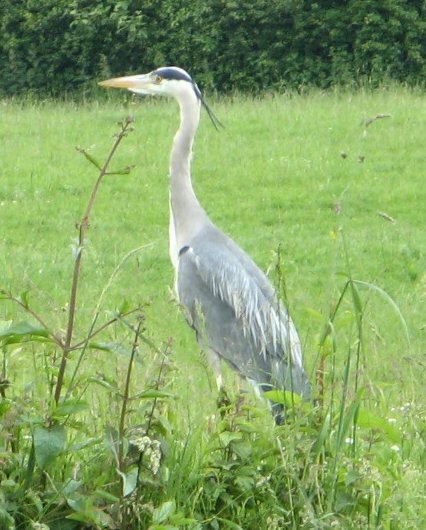 On the opposite bank I spotted a heron, photo 11. This stretch of the walk continues for just a short distances down to bridge 145, photo 12, where the route leave the canal and heads right up Sharpes Lane. This leads down to the A4251 and Bourne End where the route turns left passing the Complete Outdoors Camping Shop. A little further down the road, opposite the Village Hall the route turns right along a footpath that soon becomes a broader tree lined track which heads gently uphill towards the A41. Crossing the A41 over a bridge the Hertfordshire Way heads into Little Hay golf course, photo 13, where the route continues heading uphill alongside a fairway. The route continues through the golf course and once it reaches the top of hill joins a track which followed round towards the entrance of the golf course. Just before the entrance is reached the Hertfordshire Way diverts to a path that goes on the left through a patch of woodland. Reaching a road the route heads across and continues along Bush Hill Road. The route then turns right into Stoneley Lane. This unsurfaced road is followed to the outskirts of Bovingdon where the route bears left through the churchyard, photo 14. At the end of the churchyard the route turns right down Church Street then left past the Bull Pub into Chipperfield Road. It was quite a warm day and I had by this stage drunk most of my water so I made a quick detour along the High Street, photo 15, to the Costcutters to buy an extra litre, along with a packet of crisps to boost my salt intake. Reaching Austins Mead the route turns right and at the end of the houses takes a footpath that runs between the houses which leads out into a field. Here the path has also linked up with the route of the Chiltern Way once again. Reaching a road the Hertfordshire Way continues ahead along Holly Hedges Lane, photo 17. This lane leads into a patch of woodland where at a corner the Hertfordshire Way continues ahead into Woodmans Wood along the footpath signed Belsize three quarter of a mile. Leaving the Woodland the route heads down hill over a field to join a road where the Hertfordshire Way turns left. At a road junction the route bears right up Windmill Hill then immediately right onto a bridleway that leads into Chipperfield Common. This is followed for some distance along the bridleway until a pond is reached on the left, photo 18. Just past the pond the Hertfordshire Way bears off to the left away from the bridleway. Moving through the common the route crosses the road and heads down a footpath besides a driveway which is sign posted Kings Langley one and a half miles. This runs down besides some stables and then along beside fields, photo 19. The route heads gently down hill besides a couple of fields before heading uphill over a grassy field to reach another a little hedge lined footpath close to the top of the hill. The route crosses a footbridge over the A41 and turns left, then soon right, to take a farm track that leads gently downhill to the A4251. Up ahead I could see and hear the traffic from the M25 which I had not realised was so close at this point. The route passes through a farmyard to reach the road where it turns right. Just before the roundabout the route turns left down Station footpath. The route joins a road to cross back over the Grand Union Canal, photo 20, then heads gently up hill to Kings Langley Station where I finished this stage of the walk. Reaching the station car park I have walked 13.4 miles which made it 9.61 Hertfordshire Way miles for the day. I had a little wander round the station and noticed it was only 10 minutes until the next train for Hemel Hempstead which run hourly on Sundays. However, because I was still feeling quite energetic I decided head back down to the Grand Union Canal and to walk back to Hemel Hempstead rather than take the train. A short distance up the canal I passed an area where the towpath and canal were covered in white fluff (not sure of the technical term) that was drifting down from the trees, photo 21. Generally though it was a fairly uneventful walk along the towpath back to the car. I passed a small canal boatyard at Nash Mills and a little further on passing a pub I could hear a sound system playing Johnny Nash singing "I can see clearly now" which struck me as rather apt for the location. A little further along the route heads past Apsley Lock and Apsley Marina, photo 23, where for quite a distance there was a lot of new housing lining the towpath on either side which has replaced the old industrial buildings. Eventually I reached Fishery Lane where I had joined the canal at the start of the walk and headed off up to the car at Hemel Hempstead station, photo 24. Reaching the car I had walked 17.6 miles for the day which made this just the longest walk of the year so far.